"Debug" redirects here. For the shell command, see debug (command). For the German magazine, see Debug (magazine). For the 2014 film, see Debug (film). Numerous books have been written about debugging (see below: Further reading), as it involves numerous aspects, including interactive debugging, control flow, integration testing, log files, monitoring (application, system), memory dumps, profiling, Statistical Process Control, and special design tactics to improve detection while simplifying changes. The terms "bug" and "debugging" are popularly attributed to Admiral Grace Hopper in the 1940s. 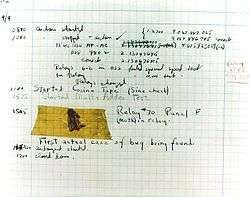 While she was working on a Mark II Computer at Harvard University, her associates discovered a moth stuck in a relay and thereby impeding operation, whereupon she remarked that they were "debugging" the system. However the term "bug" in the meaning of technical error dates back at least to 1878 and Thomas Edison (see software bug for a full discussion), and "debugging" seems to have been used as a term in aeronautics before entering the world of computers. Indeed, in an interview Grace Hopper remarked that she was not coining the term. The moth fit the already existing terminology, so it was saved. 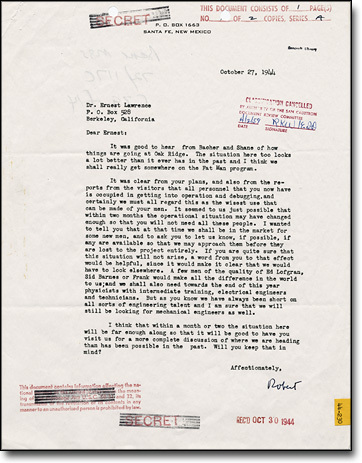 A letter from J. Robert Oppenheimer (director of the WWII atomic bomb "Manhattan" project at Los Alamos, NM) used the term in a letter to Dr. Ernest Lawrence at UC Berkeley, dated October 27, 1944, regarding the recruitment of additional technical staff. The Oxford English Dictionary entry for "debug" quotes the term "debugging" used in reference to airplane engine testing in a 1945 article in the Journal of the Royal Aeronautical Society. An article in "Airforce" (June 1945 p. 50) also refers to debugging, this time of aircraft cameras. Hopper's bug was found on September 9, 1947. The term was not adopted by computer programmers until the early 1950s. The seminal article by Gill in 1951 is the earliest in-depth discussion of programming errors, but it does not use the term "bug" or "debugging". In the ACM's digital library, the term "debugging" is first used in three papers from 1952 ACM National Meetings. Two of the three use the term in quotation marks. By 1963 "debugging" was a common enough term to be mentioned in passing without explanation on page 1 of the CTSS manual. Kidwell's article Stalking the Elusive Computer Bug discusses the etymology of "bug" and "debug" in greater detail. As software and electronic systems have become generally more complex, the various common debugging techniques have expanded with more methods to detect anomalies, assess impact, and schedule software patches or full updates to a system. The words "anomaly" and "discrepancy" can be used, as being more neutral terms, to avoid the words "error" and "defect" or "bug" where there might be an implication that all so-called errors, defects or bugs must be fixed (at all costs). Instead, an impact assessment can be made to determine if changes to remove an anomaly (or discrepancy) would be cost-effective for the system, or perhaps a scheduled new release might render the change(s) unnecessary. Not all issues are life-critical or mission-critical in a system. Also, it is important to avoid the situation where a change might be more upsetting to users, long-term, than living with the known problem(s) (where the "cure would be worse than the disease"). Basing decisions of the acceptability of some anomalies can avoid a culture of a "zero-defects" mandate, where people might be tempted to deny the existence of problems so that the result would appear as zero defects. Considering the collateral issues, such as the cost-versus-benefit impact assessment, then broader debugging techniques will expand to determine the frequency of anomalies (how often the same "bugs" occur) to help assess their impact to the overall system. Debugging on video game consoles is usually done with special hardware such as this Xbox debug unit intended only for developers. Debugging ranges in complexity from fixing simple errors to performing lengthy and tiresome tasks of data collection, analysis, and scheduling updates. The debugging skill of the programmer can be a major factor in the ability to debug a problem, but the difficulty of software debugging varies greatly with the complexity of the system, and also depends, to some extent, on the programming language(s) used and the available tools, such as debuggers. Debuggers are software tools which enable the programmer to monitor the execution of a program, stop it, restart it, set breakpoints, and change values in memory. The term debugger can also refer to the person who is doing the debugging. Generally, high-level programming languages, such as Java, make debugging easier, because they have features such as exception handling that make real sources of erratic behaviour easier to spot. In programming languages such as C or assembly, bugs may cause silent problems such as memory corruption, and it is often difficult to see where the initial problem happened. In those cases, memory debugger tools may be needed. In certain situations, general purpose software tools that are language specific in nature can be very useful. These take the form of static code analysis tools. These tools look for a very specific set of known problems, some common and some rare, within the source code. All such issues detected by these tools would rarely be picked up by a compiler or interpreter, thus they are not syntax checkers, but more semantic checkers. Some tools claim to be able to detect 300+ unique problems. Both commercial and free tools exist in various languages. These tools can be extremely useful when checking very large source trees, where it is impractical to do code walkthroughs. A typical example of a problem detected would be a variable dereference that occurs before the variable is assigned a value. Another example would be to perform strong type checking when the language does not require such. Thus, they are better at locating likely errors, versus actual errors. As a result, these tools have a reputation of false positives. The old Unix lint program is an early example. For debugging electronic hardware (e.g., computer hardware) as well as low-level software (e.g., BIOSes, device drivers) and firmware, instruments such as oscilloscopes, logic analyzers or in-circuit emulators (ICEs) are often used, alone or in combination. An ICE may perform many of the typical software debugger's tasks on low-level software and firmware. Normally the first step in debugging is to attempt to reproduce the problem. This can be a non-trivial task, for example as with parallel processes or some unusual software bugs. Also, specific user environment and usage history can make it difficult to reproduce the problem. After the bug is reproduced, the input of the program may need to be simplified to make it easier to debug. For example, a bug in a compiler can make it crash when parsing some large source file. However, after simplification of the test case, only few lines from the original source file can be sufficient to reproduce the same crash. Such simplification can be made manually, using a divide-and-conquer approach. The programmer will try to remove some parts of original test case and check if the problem still exists. When debugging the problem in a GUI, the programmer can try to skip some user interaction from the original problem description and check if remaining actions are sufficient for bugs to appear. After the test case is sufficiently simplified, a programmer can use a debugger tool to examine program states (values of variables, plus the call stack) and track down the origin of the problem(s). Alternatively, tracing can be used. In simple cases, tracing is just a few print statements, which output the values of variables at certain points of program execution. Print debugging (or tracing) is the act of watching (live or recorded) trace statements, or print statements, that indicate the flow of execution of a process. This is sometimes called printf debugging, due to the use of the printf function in C. This kind of debugging was turned on by the command TRON in the original versions of the novice-oriented BASIC programming language. TRON stood for, "Trace On." TRON caused the line numbers of each BASIC command line to print as the program ran. Remote debugging is the process of debugging a program running on a system different from the debugger. To start remote debugging, a debugger connects to a remote system over a network. The debugger can then control the execution of the program on the remote system and retrieve information about its state. Post-mortem debugging is debugging of the program after it has already crashed. Related techniques often include various tracing techniques (for example,) and/or analysis of memory dump (or core dump) of the crashed process. The dump of the process could be obtained automatically by the system (for example, when process has terminated due to an unhandled exception), or by a programmer-inserted instruction, or manually by the interactive user. "Wolf fence" algorithm: Edward Gauss described this simple but very useful and now famous algorithm in a 1982 article for communications of the ACM as follows: "There's one wolf in Alaska; how do you find it? First build a fence down the middle of the state, wait for the wolf to howl, determine which side of the fence it is on. Repeat process on that side only, until you get to the point where you can see the wolf." This is implemented e.g. in the Git version control system as the command git bisect, which uses the above algorithm to determine which commit introduced a particular bug. Saff Squeeze – a technique of isolating failure within the test using progressive inlining of parts of the failing test. In contrast to the general purpose computer software design environment, a primary characteristic of embedded environments is the sheer number of different platforms available to the developers (CPU architectures, vendors, operating systems and their variants). Embedded systems are, by definition, not general-purpose designs: they are typically developed for a single task (or small range of tasks), and the platform is chosen specifically to optimize that application. Not only does this fact make life tough for embedded system developers, it also makes debugging and testing of these systems harder as well, since different debugging tools are needed in different platforms. to collect information about the operating states of the system that may then be used to analyze the system: to find ways to boost its performance or to optimize other important characteristics (e.g. energy consumption, reliability, real-time response etc.). An early example of anti-debugging existed in early versions of Microsoft Word which, if a debugger was detected, produced a message that said: "The tree of evil bears bitter fruit. Now trashing program disk. ", after which it caused the floppy disk drive to emit alarming noises with the intent of scaring the user away from attempting it again. ↑ Robert V. D. Campbell, Evolution of automatic computation, Proceedings of the 1952 ACM national meeting (Pittsburgh), p 29-32, 1952. ↑ Alex Orden, Solution of systems of linear inequalities on a digital computer, Proceedings of the 1952 ACM national meeting (Pittsburgh), p. 91-95, 1952. ↑ Peggy Aldrich Kidwell, Stalking the Elusive Computer Bug, IEEE Annals of the History of Computing, 1998. ↑ E. J. Gauss (1982). ""Pracniques: The "Wolf Fence" Algorithm for Debugging",". ↑ Shields, Tyler (2008-12-02). "Anti-Debugging Series - Part I". Veracode. Retrieved 2009-03-17. ↑ Ross J. Anderson. Security Engineering. p. 684. ISBN 0-471-38922-6. ↑ "Microsoft Word for DOS 1.15". Artzi, Shay; Adam Kiezun; Julian Dolby; Frank Tip; Danny Dig; Amit Paradkar; Michael D. Ernst (2008). "Finding bugs in dynamic web applications": 261. doi:10.1145/1390630.1390662.